Forecast: The opener is a bottom-rung maiden claiming miler for sophomore fillies. Tick Tock has failed as the choice in her last pair but adds blinkers, is relatively strong in the speed figure department and has hit the board in each of her three career starts. She rates top billing, but at 2-1 on the morning line offers little value. Lily Con drops to the bottom and has the kind of early speed that could make her dangerous. The break in the weights with the switch to bug boy Diaz certainly won’t hurt. Ride Out the Storm is another class dropper likely to improve against this group. She has the two-sprints-and-a-stretch out pattern and a pedigree that should allow her to handle a route. 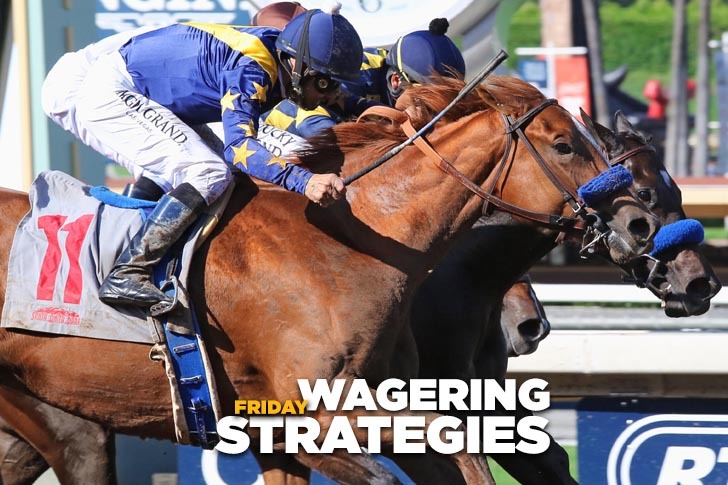 Forecast: Tiny Tina is winless in five starts over the local lawn, but she has a good recent runner-up effort down the hill at this starter’s allowance level and won at this trip last summer at Del Mar. She has good early speed but might be most effective if held up early and allowed to run late. Madaket Sunset is probably more effective sprinting than routing but if she can make the lead without pressure she’ll take this group a long way. Take a Leap closed a gap sprinting in the same race Tiny Tina exits and stretches out today to her preferred trip. She has two prior wins over this course and distance and with only nine career starts probably has room for some improvement. Forecast: ​This is another wide-open affair that requires a spread in rolling exotic play. We’ll go three-deep but not with a huge degree of confidence. Iron Curtain is racing in solid form and has a good stalking style that should provide him every chance from the top of the lane to the wire. He’s a fit based on speed figures and Quinonez knows him well. Buck Duane has the blinkers off angle that we like but was a voided claim in his last start. He’s also winless in seven starts over the local main track but has finished in the money in his last pair and should at least get a piece of it again today. Giddymeister is re-equipped with blinkers and has a few prior races that could make him dangerous. He broke his maiden over this main track about a year ago, so there’s that. Forecast: This grass grab bag down the hill has several possibilities, among them Dahlia Azul, a route-to-spread play from the Bay Area dropping to a realistic level and landing the cozy outside post. She appears more comfortable routing than sprinting, but over this unique course she might be able to produce the last run. Swirling won a five-furlong turf sprint over the flat course in February with a strong late kick; similar tactics likely will be employed today. She has prior numbers that would bury this group but following a win she’s raised only one notch on the class ladder, so the barn clearly isn’t in love with her. Holy Moses has decent recent Phoenix form and has run well here in the past. She should be prominent throughout under Pedroza. Forecast: Rafal has trained like an excellent prospect for Baffert and should be a short price to graduate at first asking. Everything he’s done in the morning suggests he’ll beat this field, so we’ll make the New York-bred son of Alpha a no-value rolling exotic single. Forecast: ​Route Six Six is improving with racing, breaking his maiden with a sharp number in game style. He has enough early speed to secure a favorable pace-stalking spot in a race that projects to be run at a moderate pace, at best. Super Duper Cooper is strictly the one to beat and is a “must use” as well in rolling exotic play. He’s a first-off-the-claim for Baltas and has every right to improve; however, he’s zero-for-12 lifetime over the Santa Anita main track. Both should be included in rolling exotic play; we’ll have a few extra tickets keying Route Six Six on top. Forecast: Beach View is a proven marathoner and always has been genuine and consistent. The son of Giant’s Causeway should draft into a comfortable stalking position and then have every chance when the pressure gets turned on in the final furlong. Epical, second in the same race Beach View exits, is the one to fear most. If they hand him the front end, the Cassidy-trained gelding may never look back. Both should be used in rolling exotic play; Beach View probably will be the better price of the two, so we’ll press with him on top. Forecast: Outlaw once was well regarded and drops to his lowest level ever. He has numbers that will beat this field, but he’s already failed three times as the favorite, so he’s hardly one to trust. Raggy Rocks hasn’t yet mastered the art of breaking from the gate, but if he ever decides to leave with his field he might be quite competitive in this league. Maybe the addition of blinkers today will help. We’ll try to get by using just these two but if you can afford to go deeper, feel free to spread.